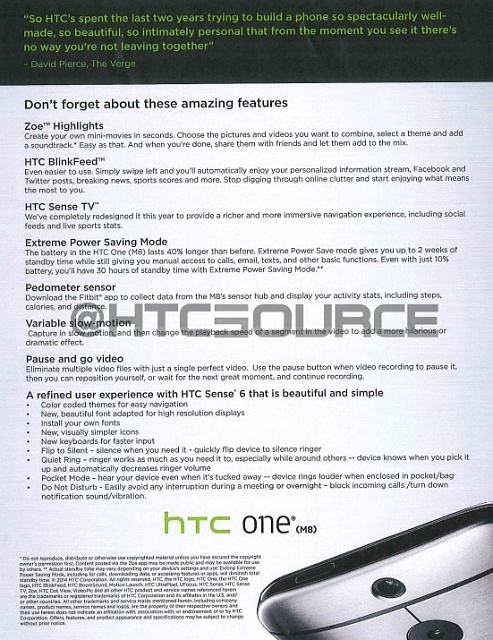 HTC One (M8) sales doc leaked - Shows 5 reasons why you should get the M8 over an S5. 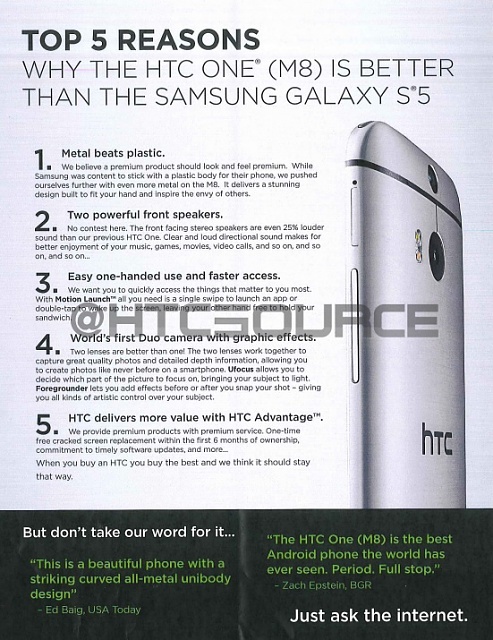 In a time where the S5 just launched and is racking up sales, HTC has shown it's sales associates a document detailing reasons why consumers should buy the One M8 over an S5. Well, it has been leaked, for your viewing pleasure. Now, I think most of these are valid reasons, apart from the Duo Camera. It's not terrible or anything, but from what I've seen, the S5's 16MP camera has been circling over the M8's 4MP shooter several times. I'm sure devs can make the Duo Camera concept more creative, and 4MP should be fine if you're not an avid photographer, but IMO, that's hardly a reason why I would pick an M8 over an S5. Now, I believe both phones are great, and consumers are making a good choice choosing either of the 2 (and the Z2), but expect the market to be highly competitive soon. Dizfunctions, baconnbitz2010, angieberry10 and 2 others like this. Fingerprint and Heart rate sensor that hardly works. And reports suggest some trouble with the camera included very slow to focus. Just because it has a 2800mah battery doesn't mean it's going to get better battery life. My guess is the m8 will be slightly better due to Sense being more optimized and a lighter ui. D13H4RD2L1V3, bembol, ugxvibe and 3 others like this. And yes. Download Booster is not available in the States. Don't know why, though. It seems to be a killer feature. freddyttt and A895 like this. I agree with some of the other posters; the heart rate monitor and finger print scanner are gimmicks. Ultimately, they constitute little more than bloatware for me. And although a water-proof phone sounds like a nice-to-have, it's never once been an issue for me in all the years I've had cell phones. Personally, having a company that will replace a phone with a cracked screen (for free) is a much bigger win. I can't speak for everyone else, but I spend a lot more time holding my phone above solid ground than I do above three feet of water. I don't know what kind of test they do for on screen time but I know I have had just under 7 hours of on screen time from the HTC One M7. I think I could get 9 or more from the M8. We just need to hop over to the S5 forums and check out their battery usage 'real world' vs. ours. I hardly trust any reviews anymore. Skyway and ErnstMach like this. I gotta be honest. I just came home with my new M8 from the T-Mobile store and I love it. Don't regret my decision at all. Having said that, I could also make my own list of reasons I could have easily gone with an S5 not the least of which is the camera and that amazing screen. These are both excellent devices and really come down to preference. At this point this new HTC makes more sense for my lifestyle. Just wanted to throw that out there. Skyway, isitme, D13H4RD2L1V3 and 1 others like this. Also, hate patent wars. Makes no sense whatsoever, IMO. Well, metal and plastic does have their own advantages and disadvantages. Samsung is obviously sticking with plastic for that removable cover. Never really need my removable cover on my Nexus. I like using the little pin to remove my SIM and stuff. Never needed to replace a battery or have to swap it out before. I agree with the list but it ain't going to change anything...as far as sales, Samsung will again dominate. I used to cry about removable battery but honestly I rarely took advantage of it. Besides today's Super Phones should/will last 12 hours. Convert carrier HTC One (M8) to unbranded stock? Would you recommend this phone? Where can I get the kitkat update without paying for some FTP server? Verizon Galaxy S5 buy one get one free "No Contract" question?